It was not so long ago that the eyes of the world were transfixed on Tahrir Square, the epicentre of Egypt’s revolutionary movement, and its poignant calls for “peace, bread and social justice”. The recent bombing of a Coptic Orthodox Cathedral in Cairo, however, serves as a reminder that as united as the social platform seemed, it was unable to transcend the time and space of the Square. The moral economy of the January 25 Revolution failed to strike lasting roots in Egyptian society. As the revolution progressed, global media was quick to capitalise on brief moments of interreligious unity: Coptic Christian protestors linking hands to form a human barricade around their Muslim compatriots as they began Friday midday prayers; Muslims joining Christians in prayer for the Coptic youth killed in army clashes; imams and priests protesting together, arm-in-arm; and crowds chanting “Christian, Muslim, one hand!” But as Egypt struggles with socio-political chaos in the post-Tahrir era, a flood of religious tension and violence continues to make itself evident. Tahrir means liberation in Arabic. But as Egypt quickly succumbed to sectarian violence in the few weeks after the 2011 Revolution, its name barely resembled it. Despite the high hopes that the ousting of the authoritarian leader would usher in an era of national unity between the country’s Muslim majority and Christian minority, the period following Mubarak’s resignation was greeted by a number of incidents of sectarian violence. For example, a month after the largely peaceful Tahrir demonstrations, rumours of an illicit affair between a Copt and a Muslim sparked a series of bloody clashes between the two religious communities. The Maspero massacre on 9 October 2011 left 28 peaceful protestors dead, most of whom were Copts protesting government passivity towards church bombings. And by the end of 2011, there were over 416 documented cases of fatalities and injuries of religious conflict between Egypt’s Muslims and Christians. Five years since the start of the revolution, Copts continue to face the disenchanting reality that Egypt is not Tahrir Square. The future of the Coptic minority in Egypt continues to remain widely uncertain. Sunday’s bombing at St. Mark’s Coptic Orthodox Cathedral marks the deadliest sectarian attack against Egypt’s Coptic minority community to date. This massacre underscores the Egyptian government’s policy of subordinating religion to the needs of the state—a policy which works to cement the state’s hold on power while marginalising the Coptic minority. It also brings to light the gap that Egypt’s Christians face between de facto and de jure rights: while Copts supposedly hold “absolute” rights of freedom of religion under the 2014 constitution, Article II of the constitution states that Islam is the promulgated state religion and that “the principles of Islamic Sharia are the principle source of legislation”. Even after the end of thirty years of repressive rule by the Mubarak regime, Copts still face unequal citizenship in Egypt. 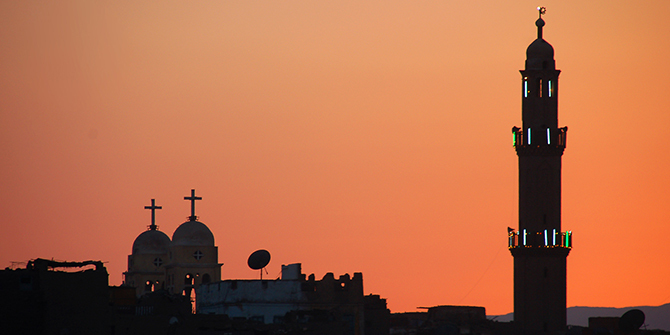 The attack of Egypt’s Coptic Christians continues with increasing intensity, highlighting the critical need to develop real policy solutions that combat religious violence. While the future of Muslim-Christian relations in Egypt will not be transformed overnight, they will certainly not change through state reconciliation sessions, a form of community-based conflict resolution dialogue overseen by a state-sponsored arbitrator. The set-up of such sessions is inherently problematic. Although both Christian and Muslim religious leaders are usually included, the meetings are often overwhelmingly Muslim in representation. This lack of minority representation undermines the neutrality of the dialogue and further marginalises Copts from equal participation. Reconciliation sessions are a quicker and cheaper option than the due process of law, hence their appeal to the current regime. Nonetheless, the sessions are largely ineffective in alleviating religious tensions between Christians and Muslims and often allow perpetrators of sectarian violence to walk free. They represent a familiar strategy by the Egyptian state that operates under the guise of national unity but, in reality, embodies the hallow rhetoric of the old regime. The real test for Egypt today is whether the values of freedom and liberty that defined the Tahrir movement are powerful enough to re-emerge and overcome the rifts of sectarian violence. But until the current regime explicitly confronts the phenomenon of religious violence and conducts a structural reform of existing institutions that reinforce patterns of conflict, Egypt’s Coptic minority will increasingly become a relic of the past. Marina Elgawly is a Coptic-American MSc candidate in International Relations at LSE. Her research interests include the politics of sectarianism and foreign policy behaviour of Middle Eastern states.